A few months ago I had come across an article which in essence was an April fools joke style article… saying rhinos were descendants of unicorns! 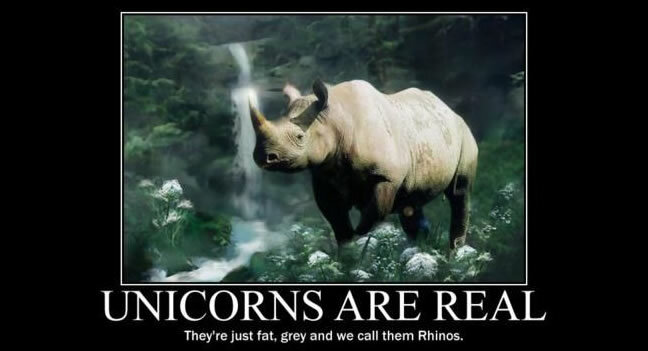 I however actually think there may be some truth to this, not scientifically of course but in some way the rhino does represent traits of the mythical unicorn. Its horn being the first most discernible trait. And a fun fact is the Latin name for the Greater one-horned rhino is Rhinoceros Unicornis. That can’t be sheer coincidence now can it. Rhinos are being poached and hunted throughout the world. With educating people and children maybe we can help save the rhinos before they reach extinction. Recently our team visited the Hluhluwe Game Reserve and they got to witness the new venture of dehorning rhinos in order to prevent them from being poached. It was dare I say a graphic experience however the rhino was completely comfortable by being sedated and the procedure was performed by a qualified vet to ensure the rhino was in no way harmed and was in as little or no pain as possible during the procedure. First hand encounters with these wondrous creatures left our team feeling a little more committed to our cause in aiding the prevention of poaching and the conservation of rhinos across the globe. September is our RHINO MONTH so we want to do our best to help raise awareness with regards to helping save the rhinos, not just in South Africa but across the globe as poaching of rhinos is now an international crisis. The smallest bit of information spread is a great help. The smallest contribution to aid in conserving the rhinos will make a big impact towards helping save the rhinos. Going to schools, cub scout meetings, religious gatherings or any other community-based group to educate others on how to advocate against poaching. You’d be surprised at how many people are keenly unaware of the misfortune of rhinos and are eager to pitch in. So a fun fact: For those who don’t know, the Rhino is part of our BIG FIVE and appear on our R10 note as well. So in South Africa supporting, protecting and conserving our beloved rhinos is important to you! Do your bit, whatever it is to help SAVE the RHINOS!